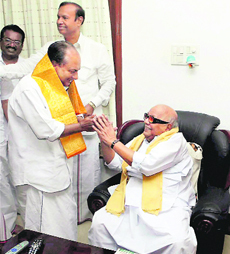 Congress leader and Defence Minister A K Antony today met DMK chief M Karunanidhi as part of consultation process among UPA allies on the Presidential election to arrive at a consensus leader to succeed incumbent Pratibha Patil, who is retiring on July 25. The release of Sukma District Collector Alex Paul Menon from Maoist custody appears to be headed for a long haul. The third round of talks between two representatives each of the �Red rebels� and the Chhattisgarh Government ended at the Circuit House here late in the night after five hours. The Shiv Sena and the Congress today traded insults over the nomination of cricketer Sachin Tendulkar to the Rajya Sabha. At a function to felicitate him here, Shiv Sena supremo Bal Thackeray called the nomination of Tendulkar as "the real Dirty Picture". The move of successive governments in Punjab to make school masters and lecturers officiate as Headmasters and Principals and thereby save on salary and allowances to be paid against higher grades has boomeranged. Britain is considering placing surface-to-air missiles on residential flats close to the Olympic Park as part of the multi-layered air security plan to protect the skies over London during the high-profile Games in the city from July. An Indian espionage agency keeping tabs on terrorism modules operating from Pakistan is nowadays �eyeing� Kashmir�s world-famous blue sapphires. Intercepts of snatches of conversation between unknown persons in Pakistan occupied Kashmir and Jammu and Kashmir about mining operations at Padder sapphire mines in Doda district have put these on the spy agency�s radar.